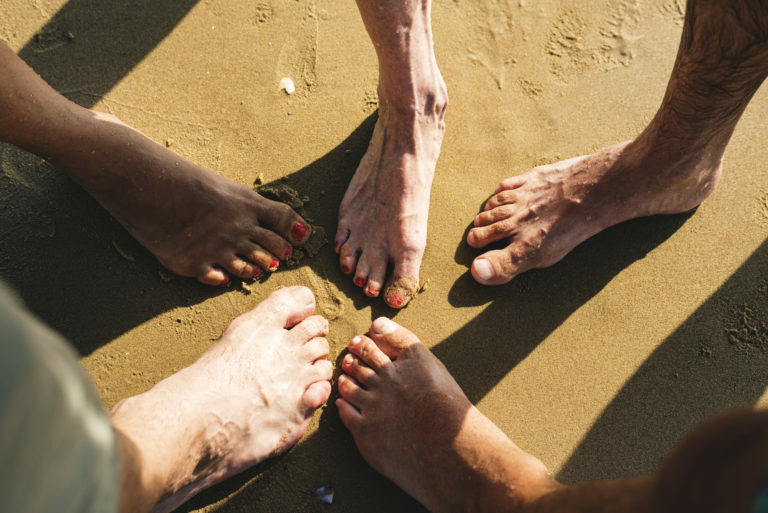 Aging changes every part of your body, your feet included. These changes generally develop gradually as collagen production and cell turnover rates slow down. The subtle physiological signs of aging can be noticed at any age if good foot care is not practiced routinely. Generally, most changes in feet are noticed in the forties and fifties. Fortunately, it is never too early, nor too late, to treat your feet and reducing age-related issues. Dr. Amin has compiled the list below of the most common foot and ankle issues that develop with age and how to minimize the effects of aging. Your feet have a natural padding of fat and collagen inside the balls and heels to cushion your every step. As you get older and collagen production slows, this padding will decrease and diminish the natural shock absorption. Walking will increase in discomfort and pain. It can feel like you are walking on rocks or directly on your bones. The loss of fat padding can increase the likelihood of having a stress fracture or bruised bones. Additionally, you are more likely to develop corns or bunions. The best solution is to get quality shoes with enough internal support and cushioning for your feet. Over-the-counter inserts and custom orthotics are excellent ways to add support and padding to your current footwear. Arthritis, an inflammation of the joints, affects almost half of the people in their sixties and seventies. Although your feet have over 30 joints that can and will deteriorate with age, arthritis most commonly affects the midfoot joints, big toe joints, and the ankle joints. Arthritis causes pain, stiffness, and a decreased range of motion. The three most common types of arthritis are: A. osteoarthritis, caused by wear-and-tear to the joint bones and cartilage; B. rheumatoid arthritis, an inflammation of the joint lining; and C. gout, an autoimmune disorder where uric acid crystals build up around joints. You can try to prevent arthritis by wearing comfortable shoes that fit well, participating in low-impact exercises, focusing on proper form during exercise, and avoiding unnecessary stress on the foot joints. The best treatment for arthritis will depend on what type of arthritis you have and the severity. Treatment may include custom orthotics, physical therapy to increase range of motion, anti-inflammatory medication, weight loss, and/or surgical procedures. Potential circulation issues include circulatory obstruction, diabetes, and vein disease. A frequent symptom of circulation issues is numbness and slower healing. Additionally, the aforementioned conditions can also lead to nerve damage which will drastically slow the healing process. It is important to keep all regular medical appointments and to check the entirety your feet regularly for injuries or other abnormalities, using a mirror if necessary. Promptly treat any injuries. Your skin produces less sweat and oil as you get older. Combine that with the depletion of collagen and a thinning of the skin and you have a recipe for pain. Allowing the skin to dry out can cause calluses, cracks in the skin, redness, and rashes. The cracks in your feet can easily become infected. Wash your feet every day with warm soapy water and a washcloth, making sure to clean between your toes. Dry your feet thoroughly and apply a high-quality moisturizer to your feet (but avoiding between your toes this time). See your podiatrist if you notice changes in the skin color or other signs of infection. Abnormal bends in the joints of your toes are called hammertoe. Starting as a mild discomfort, this condition will lead to ever-increasing levels of pain, stiffness, and swelling. Furthermore, hammertoes are more likely to lead to corns and calluses. Prevention is crucial as hammertoes are essentially permanent once developed. Wear properly fitted shoes with a wide enough toe box to fully accommodate your toes. You can still wear pointy-toed shoes for special occasions. Stretch your toes daily after taking your shoes off. Relieve hammertoe pain by wearing toe pads and routinely stretching your toes and feet. Hammertoes can potentially be realigned with surgery. The shape and size of your foot are determined in part by the ligaments and tendons that hold it all together. Over time the ligaments will lose strength, causing them to lengthen, while the tendons lose water content and tighten up. These structural changes result in wider, longer, and flatter feet. Additionally, it may change your gait, lead to stability loss, and increases your risk of foot and ankle sprains. Rigid tendons are more likely to tear or rupture, so daily stretching is crucial. We recommend starting with heel raises, toe raises, standing calf stretch, standing soleus stretch, and rolling your foot over a tennis ball. It is important to stretch daily, especially after exercise. Get your foot measured every year to ensure you are wearing the proper size. Additionally, you may benefit from getting an insert or custom orthotics to support the falling arch. As your hormone production declines, toenails usually become thicker and more brittle. The hormonal changes can also cause nails to discolor, form uneven ridges, or crack. Although proper nail care can greatly improve the appearance of your nails, it cannot completely prevent these age-related changes. If the nail becomes yellow with chalky-looking sections, then you may have the fungal infection onychomycosis. Toenail fungus does not cure itself, so make an appointment with your podiatrist as soon as possible to treat the infection. Because of these changes, the nails become more difficult to trim correctly. Toenails should be trimmed straight across to prevent ingrown nails. Go to a medical spa for a safe, clean pedicure instead of taking a risk with a regular nail salon. Edema, swelling caused by a build-up of fluid, is a very common foot and ankle symptom in older individuals. Edema has several different potential causes, including age-related issues such as liver disease, kidney disease, and congestive heart failure. If the swelling lasts a long time and doesn’t go away after elevating your feet, then it could require a visit to your podiatrist to diagnose the cause(s). For more information on how to take care of your aging feet, contact Corona Foot and Ankle Group HERE. We welcome all PPO, MediCare and cash patients. Our main goal is to care for our patients, but, more importantly, to formulate a prevention plan. We also offer preventative advice which helps you lead a healthier lifestyle, including taking care of all your foot and ankle needs. We recently expanded our services with medical nail restoration for damaged toenails. You can schedule an appointment HERE.